For the long weekend, we went camping in Burlington, Vermont. 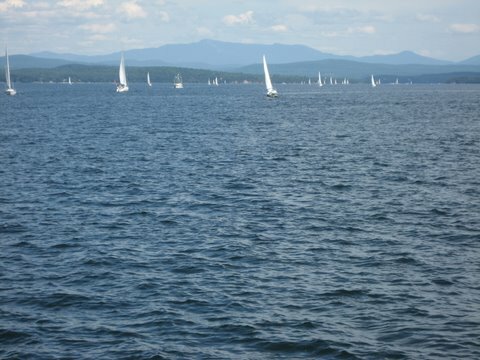 We camped at the North Beach Campground, which is right by Lake Champlain. We have been camping before, but always in State Parks, so this was a new experience for me. I think this is run by the city of Burlington. The sites were smaller and closer to each other than the ones we have seen in state parks. Plus the crowd and atmosphere on the 4th night was a total party scene, so it felt really weird. AK also mentioned that he saw a pizza delivery car going by! I later learnt that many private campgrounds allow that. But the location is prime. The campground is right off the Island Line Rail Trail bike path and also the wonderful North beach, with awesome facilities – snack bar, restrooms, picnic benches, kids playground etc. Also alcohol was allowed both on the beach and in the campground, which is always a huge plus in PK’s book :). 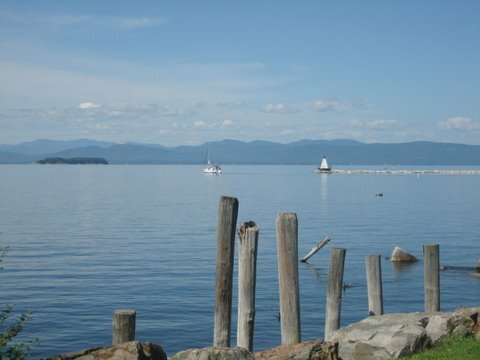 The Island Line Rail Trail is a 12.5 mile trail from Oakledge park in Burlington connecting to the Colchester Causeway which ends 2.5 miles into the middle of Lake Champlain! The campsite was about 4 miles into the trail. So, we did this section first thing in the morning. This part is quite scenic with great views of the lake and the Adirondack mountains in NY on the other side. Towards the end, there are a few street crossings you need to watch out for. At the end of the trail in Oakledge park, there is a tree house, which we almost missed. A kind lady saw the kids and suggested we may want to see it. It was really cool and I enjoyed it as much as the kids. After that we were back at the tent for some breakfast and we were also waiting for some friends to join us. They were there by noon and we set off or the rest of the trail. The next 3 miles or so, is along the backyard of big, beautiful houses by the lake. Then comes the Winooski river bridge, which was built few years ago. Otherwise, earlier bikers had to take a ferry to cross the river and continue biking on the other side. After the bridge crossing, you have to ride about a mile or so on the streets until the Colchester Airport Park around the 8th mile mark. There are good lawns and a kids’ playground, snack bar and restrooms, so we took a break here. Also, from here on the trail is all gravel which is harder to ride on than the asphalt surfaces. So, we took turns doing the rest of the trail to see the grand finale part which juts 2.5 into the lake, so that one c ouple could be with the kids at the park. The 1.5 miles to reach the Colchester causeway wasn’t so terrible, but the causeway itself was much harder to ride on. It is a crushed stone path which offers a lot of resistance and the trail is fully exposed to the sun, with no shade. But the views of the lake and the mountains are really worth it. There is a “cut” in the path and some weekends a ferry runs to take bikers to the other end of the cut, from where you can ride on to Grand Isle. The cut is mainly there for the boats to pass by, and there were lots of them. By the time we reached back the camp site, it was around 5.30 pm. After a quick round of water melon, the kids wanted to play in the water. At the end of it, we were all so tired and the kids were in bed by 9 pm. Then we all sat around by the fire with some wine and Mike’s lemonade and chatted. All I remember though is that my thighs were burning from the ride. Next morning, packing up took almost 2 hours! I know, camping is supposed to be simple living and all that, but … There were bikes to load (after removing front wheels), tents to take down, sleeping bags to be rolled up etc. 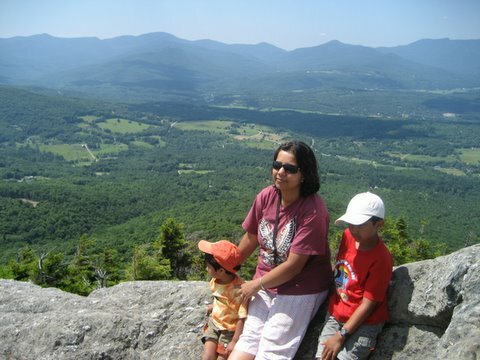 Then we headed to Stowe, to hike up the Stowe Pinnacle. My hiking book had said it was a short and easy hike, but it was neither. It was one mile longer than what the book said. And I think we found it much harder than usual because we were doing it after a day of biking 25 miles. I must have asked at least three different groups who were coming down how much further we had to go. The first time I asked, I was estimating that we were almost there but he said that we were probably half way. My heart sunk. We had plenty of water but not enough food. I took a quick vote and everyone wanted to keep going. I was especially proud of how well AK did. I think he enjoys that sense of accomplishment and pushes himself really hard. He named it the mountain which never ends and insisted that this must be the tallest mountain in VT. Anyway, the views from the top were really spectacular. We couldn’t hang around for too long, since we had the long climb down and also the drive back home. Also it is scary to hang around steep cliffs and ledges with young ones. The way down was only marginally easier, but we made it back uneventfully. Then we stopped at the Ben and Jerry’s Ice cream factory and had huge Sundaes. The kids didn’t eat more than a few bites, but we gobbled up ours. And then it was back home after about 3.5 hours of driving. I wish we had stayed another day. Downtown Burlington looked like a really nice place to walk around. Church Street is cobble stoned and pedestrian-only with good coffee shops. We didn’t get to enjoy it.